Give your complexion a natural-looking glow that will leave you looking younger, healthier and more vibrant. This sheer wash of colour dusted across your cheeks, forehead and chin gives any complexion a healthy looking radiance… it’s a glow that defies even Mother Nature. Complete with soft, natural-bristle cheek brush. This blush has a lovely bronze glow. Use less for a natural finish on your cheeks. It lasts forever and each box has a mirror and brush! BONUS!! 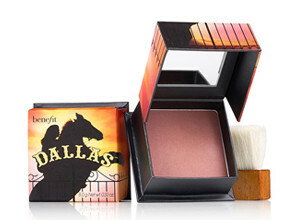 This is a beautiful blush for everyday wear as it gives your complexion a natural-looking glow that looks radiant. It brushes on easily and stays on all day with no fading, and is a very flattering colour. I absolutely love the packaging. This is definitely a new favourite of mine! I cannot even begin to describe how excited i am that Benefit is back in SA! One of the best make-up brands out there – quality products, good pricing…what more could one ask for? I used the Dallas Face Powder when Benefit was still being sold At Woolworths and I can say, hands down, this was the best blusher I have ever used! It lasted forever, pretty much a whole working day. The colour is amazing and I think its one that’s pretty universal and would suit a few skin tones. I cannot wait to rush out and buy one as no other blusher ive been using has even come close to this great product.